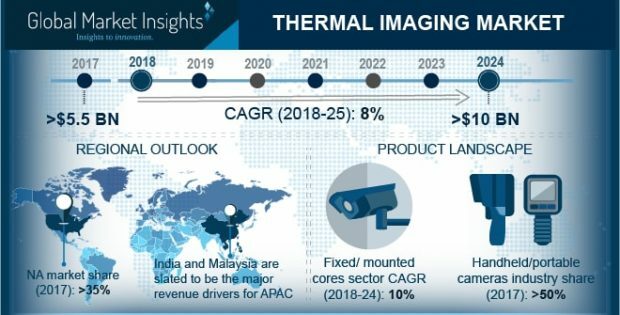 The demand across healthcare & life sciences applications in the thermal imaging market is expected to grow at a rapid pace due to the provision of advanced diagnostic and visualizations offered by such solutions. Thermography facilitates quantifiable, accurate, and non-invasive diagnostic detection by means of changes in surface temperatures. In the healthcare sector, thermography applications include muscle strain assessment, vascular evaluation, and bleeding point detection. In addition, the technology helps to identify the tissue damage site in case of injuries, aiding the sports medicine field. Personal vision system devices are expected to register the fastest growth due to the availability of low-cost solutions and demand for technology in consumer outdoor use such as hunting and mountain sports, law enforcement, and border patrol. The emergence of unmanned and airborne vehicles in defense applications is expected to stimulate thermal imaging market growth.